Ma Chao always has a -1 bonus. When Ma Chao attacks another player he can do a judgment and the target's optional abilities no longer work for the rest of the turn. Unless the target discards a card of the same suit as the judgment, the cannot use an escape. 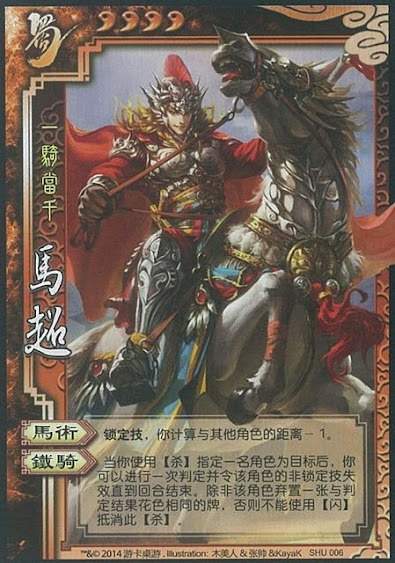 "Horsemanship" is the same ability as the original Ma Chao. When Ma Chao uses "Iron Calvary", the targets power's are nullified regardless of the judgment and the outcome of the attack. Ma Chao can only nullify optional abilities with "Iron Calvary". This also includes once-per-game abilities. The only powers that continue to work are ones that are not a choice. On the these is Lu Bu's "Matchless". Since Lu Bu does not have a choice to use his power or not, it is not nullified by "Iron Calvary". If the target of "Iron Calvary" cannot use an Escape, they also cannot use their Eight Trigrams.